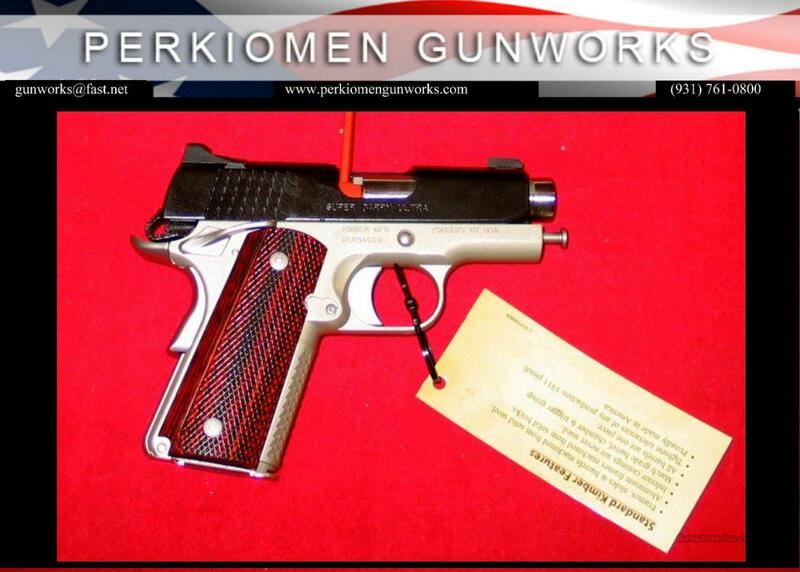 Kimber of America Super Carry ULTRA 45acp, 3 inch, New in the box issued 2013 from the Kimber Custom Shop!! One of the sharpest Kimber’s we have ever offered!! Lightweight aluminum alloy frame, Super Carry serrations (front and back straps), high cut under trigger guard – only weights 25 oz making it a perfect carry 45!! Stainless steel slide in matt black with Kim-Pro II finish to prevent holster wear, front, rear and top Super Carry serrations, Ambidextrous thumb safety, Carry melt down treatment on slide and frame edges, 18 lb recoil spring, full length guide rod, match grade SS 3 inch bbl (1:16 LH twist), SS match grade bushings, Tritium 3-dot Combat night sights, solid aluminum match grade trigger. Topped off with beautiful Micarta checkered laminated grips – see photos. +S&H of $35.00 to your local FFL for transfer. To pay on line - go to perkiomengunworks.com - find item - put in your cart and check-out. All transactions will be charged a +3% maintenance fee. We will receive notice of your payment automatically. Then all we will need is for you to have your local transfer dealer fax, email or mail their FFL license copy to ship firearm.